I love Chicken Salad. I’ve been trying to be a little bit healthier lately though. 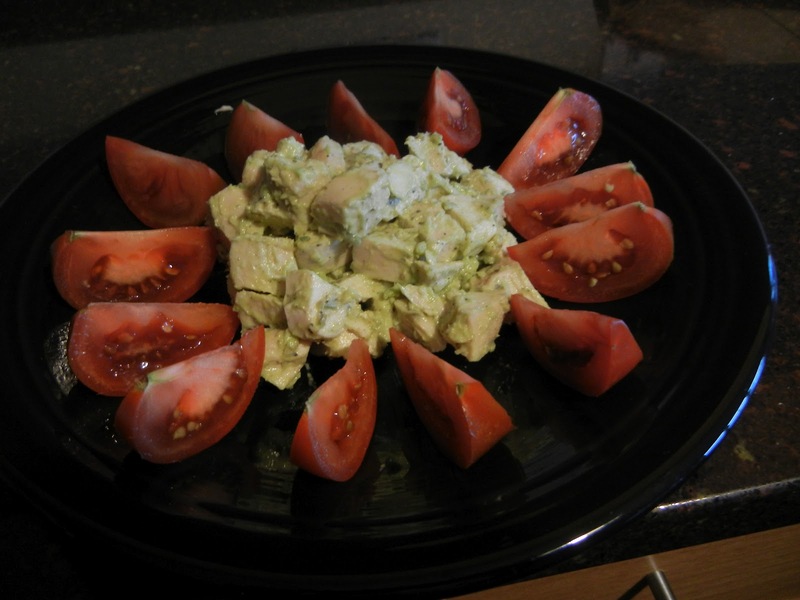 This easy and (in my mind) healthier (although I have no scientific data to prove that is healthier) take on Chicken Salad has become a staple of my summer time cooking. I start off by roasting some bone-in, skin on chicken breasts. I coat the chicken breasts with a light covering of olive oil and salt and pepper to taste then place them in an oven preheated to 350F. I cook until an instant read thermometer reads between 155F-160F — chicken is fully cooked when the juices run clear or the temperature is 165F. I find that pulling the chicken out at 155 will allow the carryover heat to bring it to proper temperature. Let the chicken cool in the fridge for a couple hours or even over night (or two nights). Cut the chicken into 0.5″-1.0″ pieces. Place in mixing bowl. Add the rest of the ingredients to the bowl and mix together. In lieu of using much more mayo, the creamy avocado helps bind the whole thing together. Of course it has a bit of a green tint to it, but you’ll look past it as soon as you taste it. I think the lime juice and the lemon pepper add a great citrus taste that is so refreshing in the warmer spring and summer months. Traditionally, I just serve this on a plate surrounded by my favorite fruits (mangoes, strawberries, bananas) and veggies (tomatoes) but it would go wonderfully on a baguette as a sandwich. Have you updated a classic recipe – attempting to make it healthier? Have you used avocado as a mayo alternative before? Do you agree that lemon pepper is an underused ingredient? By Tim in Home, Uncategorized on May 31, 2012 .